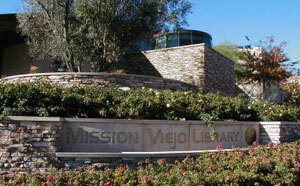 The library to serve Mission Viejo was built in 1971 by the County of Orange on land donated by the Mission Viejo Company. This library branch was operated by the Orange County Public Library System and was approximately 9,000 square feet in size. As Mission Viejo grew, and incorporated in 1988, this small library branch quickly became too small to serve a community of over 60,000. In 1995, the Mission Viejo City Council successfully negotiated with the Orange County Board of Supervisors to withdraw from the county library system and operate its own city library. Ground for the new Mission Viejo Library was broken in September 1996, and the new 27,500 square foot library opened to the public in October 1997. In October 2000, the Mission Viejo City Council voted to approve construction of a 14,400 square foot expansion to the Mission Viejo Library. This project was completed in March 2002 to bring the Library to its present size.